New York city casting directors at Donna Grossman Casting are looking for young women between the ages of 18 and 25 who are part of a girl group. The singers will be taking part in a commercial shoot and will also be singing for the commercial. 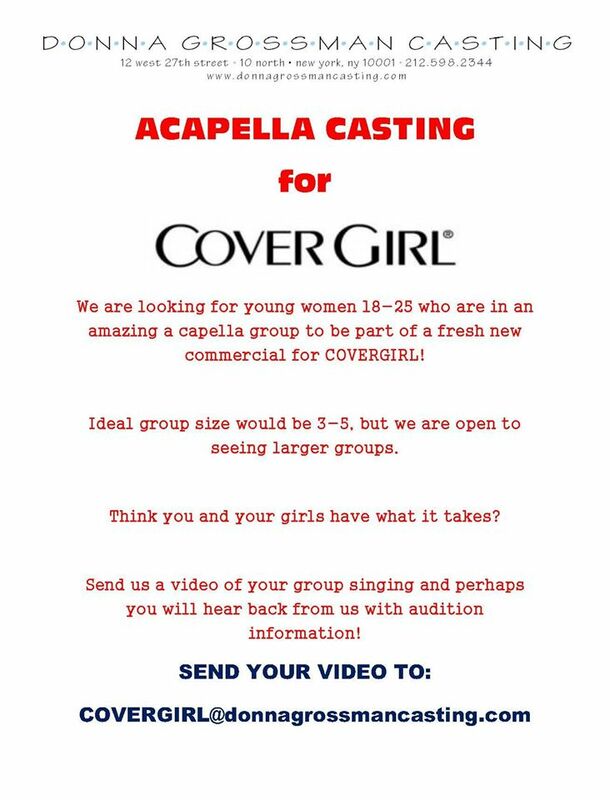 The casting directors are seeking groups that are able to sing acapella. The commercial is looking for groups that have 3 to 5 members but are open to considering larger groups as well. Think you and your girls have what it takes to be featured in a Covergirl TV commercial? Here is your chance to find out! Ladies interested in getting their group cast may submit a video of themselves performing to the email address that is listed on the below flyer. The groups selected will be called in for an audition. Auditions will most likely be held in the New York City area so please only apply if you live in or around NYC.